Our company is among the most sought after companies which deals in the manufacture, supply and export of Ink Jet Printers such as Ink Jet Printer IJP - U2, Industrial On-line Ink Jet Printer, Color Touch Screen Inkjet Printer, Multi-Head Egg Jet Printer, Industrial Hand Held Ink-Jet Printer, Industrial Smart Laser Printer, Thermal Transfer On-Line Printer and Large Character Ink Jet Printer. These printers are available in various technical specifications and have impeccable finishing. 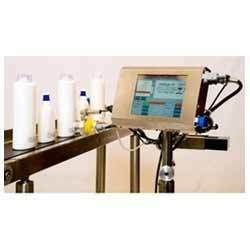 Industrial On Line Ink Jet Printer are ideal for On-Line High Speed Coding on packaging machines or bottles moving on conveyor or Winder / Re winder systems. The message can be up to 4 lines with a combination of small, medium or large characters from 1 mm to 17 mm in height along with Logos. Prints using Pietro-electric print head for spraying ink. Portable Non-Contact Ink Jet Stamp Model IJP – Jetstamp Graphic 970-MP (REINER – Germany), which is a Zero Maintenance, 300 dpi high resolution, Battery Powered SIX line (character height 1 to 12.7 mm) Printer & can be used on Porous / Non-Porous products to print B.No., Exp.Date, Time, Serial No. (AGMARK), Logos, Scannable Variable Bar Codes, etc. on labels, cartons, pouches, drums, containers, etc. It is fully programmable through the computer where it can print 6 lines Data at a very low price. This printer is a totally mobile Solution for Time Date Numbering, Barcodes and Graphics...uses such as; Parts Marking, Package Marking and validating in surgeries, pharmacies, and hospitals, marking dockets and packages in transit, quality control validation, laboratory timing and checking, production controls, delicate product marking, nightclub and meetings entry validation, etc. 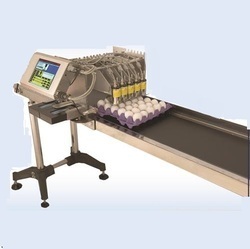 Multi-Head Egg Jet Printer is ideal for On-Line High-Speed Coding on egg trays moving on the conveyor (or on multi-track blister packing / Multiple Pouch Sealing machines). It has a capacity of printing approx. 27,000 eggs / hour. The Inking system consists of a simple disposable pre-mix ink cartridge using food grade porous or fast drying & indelible solvent-based inks (for porous and non-porous surfaces) which is just push fitted into its slot & immediately you can start printing. 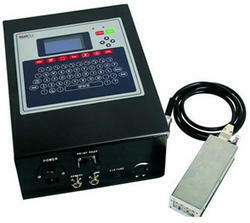 We are very well known in the manufacturing, supplying and exporting of On Line Ink Jet Label Printer. These inkjet printers are available in excellent technical specifications and these are used to produce color photos and graphics which have magnificent quality. Possessing, display of 2.8 backed up by LED back light, these ink jet printers could easily print alphanumeric, logos and bar codes. In addition to this, these are available in dimensions of 114 x 76 x 60 mm. Input Device Pocket-size IR Remote Keypad & Computer Software. Printable Images Alphanumeric, Logo, Date/Time, Counter, Barcode, etc. World's Lightest Industrial Handheld Non-Contact Ink Jet Printer Model IJP – Elfin IH, which is a 4-in-1 Compact design, Zero Maintenance, 300 dpi high resolution, Battery Powered SIX line (character height 1 to 12.7 mm) Printer & can be used on Porous / Non-Porous products to print B.No., Exp.Date, Time, Serial No. (AGMARK), Logos, Scannable Variable Bar Codes, etc. on labels, cartons, pouches, drums, containers, etc. It is fully programmable using the 5 inch full colour Touch Screen LCD with stand-alone operation (no PC required) where it can print 6 lines Data & all Computer Fonts (local languages) at a very low price. Input Device 800 x 480 Touch Screen LCD. Weight 1.0 Kg excluding cartridge & battery. World's Smallest Industrial On-Line Non-Contact Ink Jet Printer Model IJP - Elfin IC, which is a 4-in-1 Compact design, Zero Maintenance, 300 dpi high resolution, Battery Powered SIX line (character height 1 to 12.7 mm) Printer & can be used on Porous / Non-Porous products to print B.No., Exp.Date, Time, Serial No. (AGMARK), Logos, Scannable Variable Bar Codes, etc. on labels, cartons, pouches, bottles, etc. It is fully programmable using the 5 inch full colour Touch Screen LCD with stand-alone operation (no PC required) where it can print 6 lines Data & all Computer Fonts (local languages) at a very low price. 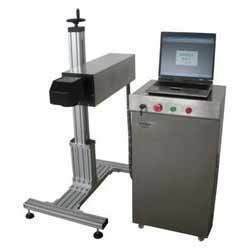 Industrial On-Line Non-Contact Large Character Ink Jet Printer Model IJP – SK2000, which is a Zero Maintenance, Mains Powered TWO line (character height 20 to 50 mm) Printer & can be used on Porous / Non-Porous products to print B.No., Exp.Date, Time, Serial No. (AGMARK), Logos, etc. on labels, cartons, pouches, drums, containers, etc. 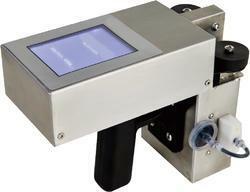 It is an ultra-compact and light inkjet printer equipped with a print-head with electromagnetic valves. It has built in keyboard & display where it can print 2 lines Data & all Computer Fonts (local languages) at a very low price. Printable Images Alphanumeric, Logo, Date/Time, Counter, etc. Printing Area 1 to 2 lines of 150 char. each from 20 to 50 mm high. Print Distance Max. 25 mm from substrate. Ink Drying Time Min. 10 seconds on plastics & laminates. Operating Range 5 ~ +45ºC, 10% - 90% RH, non-condensing. 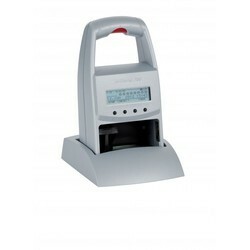 Weight 1.1 Kg ± 10 g including full ink cartridge & battery. a. Molded Box with molded slots for printer & accessories. c. 1 No. Pre-mix ink cartridge, 1 No. Solvent Cartridge. d. Operator Tool Kit, Operation & Maintenance Manual, Instruction Video CD. This printer is fully Electronic & does not have any viscosity control unit, filters, etc. & so there is no maintenance required (No AMC). It does not require separate make up or wash solution as everything is included in the ink cartridges making it very user friendly for the Operator. The running / Printing cost is only about 4 Paisa per impression (20 char). We are providing our clients Bottle Ink Jet Printer which is ideal for On-Line High-Speed Coding on packaging machines or bottles moving on conveyor or Winder / Rewinder systems. The 1 to 8 line message to be printed is easily composed of its Colored Touch Screen Graphic display with a combination of small, medium or large characters along with LOGOs, Objects & Scannable Bar Codes. The Inking system consists of disposable pre-mix ink cartridge using fast drying & indelible solvent-based inks (for porous and non-porous surfaces) which are push-fitted into its slot to immediately start printing. Metal Printing Machine Model IJP – GT250, which is a Zero Maintenance, Battery Powered TWO line (character height 20 to 50 mm) Printer & can be used on Porous / Non-Porous products to print B.No., Exp.Date, Time, Serial No. (AGMARK), Logos, etc. on labels, cartons, pouches, drums, containers, etc. It is an ultra-compact portable and light inkjet printer equipped with a print-head with electromagnetic valves. It is battery operated and Bluetooth controlled & is fully programmable through PC with user-friendly software where it can print 2 lines Data & all Computer Fonts (local languages) at a very low price. It is also capable of printing Multi-Segment messages. a. Molded Carry Case with moulded slots for printer & accessories. b. Rechargeable Batteries, Bluetooth Adapter for PC, Computer Software. 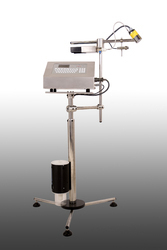 This printer is fully Electronic & does not have any viscosity control unit, filters, etc. & so there is no maintenance required (No AMC). It does not require separate makeup or wash solution as everything is included in the ink cartridges making it very user-friendly for the Operator. Portable Non-Contact Ink Jet Stamp Model IJP – Jetstamp 790-MP (REINER – Germany), which is a Zero Maintenance, 300 dpi high resolution, Battery Powered TWO line (character height 3.2 mm) Printer & can be used on Porous / Non-Porous products to print B.No., Exp.Date, Time, Serial No. (AGMARK), etc. on labels, cartons, pouches, drums, containers, etc. 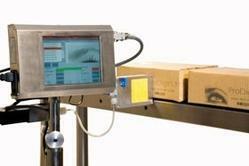 It is fully programmable through the computer where it can print 2 lines Data at a very low price. This printer is a totally mobile Solution for Time Date Numbering...uses such as; Parts Marking, Package Marking and validating in surgeries, pharmacies, and hospitals, marking dockets and packages in transit, quality control validation, laboratory timing and checking, production controls, delicate product marking, nightclub and meetings entry validation, etc. This printer is fully Electronic without CORE system & does not have any air pump, viscosity control unit, filters, etc. & so there is no maintenance required (No AMC). It does not require separate makeup or wash solution as everything is included in the disposable ink cartridges making it very user-friendly for the Operator. The running / Printing cost is only about 4 Paise per impression (25 char). Portable Non-Contact Ink Jet Pen Model IJP – Speed – i – Jet 798 (REINER – Germany), which is a Zero Maintenance, 300 dpi high resolution, Battery Powered ONE line (character height 3.2 mm) Printer & can be used on any Porous products to print B.No., Exp.Date, Time, Serial No. (AGMARK), etc. on labels, cartons, etc. It is fully programmable through the computer where it can print 1 line of Data at a very low price. 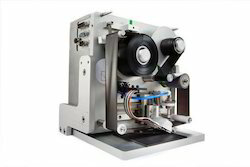 This printer is a totally mobile Solution for Time Date Numbering,...uses such as; Parts Marking, Package Marking and validating in surgeries, pharmacies, and hospitals, marking dockets and packages in transit, quality control validation, laboratory timing and checking, production controls, delicate product marking, nightclub and meetings entry validation, etc. English, Spanish, French, German, etc. 1 line of 3.2 mm with max. 40 characters. Stores 1 message at 1 time. Max. 6 mm from substrate down or in front. 4 cc disposable pre-mix ink in Cartridge form with head. Min. 5 seconds on plastics & laminates. Appx. 1 Million char. of 2 mm per cartridge of ink. 10 ~ +55ºC 10% - 85% RH, non-condensing. 125 g excluding cartridge & battery. a. 2 Nos. AA Rechargeable Batteries, Computer Software, USB Data Transfer Cable. b. 1 No. disposable Pre-mix Black ink cartridge, Cartridge cleaning Wipe. This printer is fully Electronic without CORE system & does not have any air pump, viscosity control unit, filters, etc. & so there is no maintenance required (No AMC). It does not require separate make up or wash solution as everything is included in the disposable ink cartridges making it very user friendly for the Operator. The running / Printing cost is only about 4 Paise per impression (25 char). 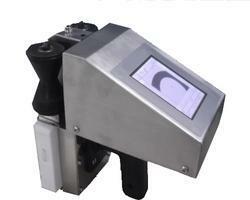 Our company is engaged in the manufacture, supply and export of Hand Held Ink Jet Printer. As their name implies, these printers use the ink for their functioning and have a colour model of Ink Jet Printer IJP - U2 Mobile. 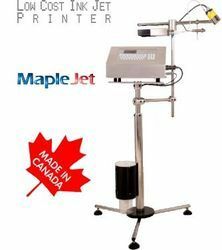 Further, these industrial hand-held ink-jet printers give a trouble-free performance for long periods of time and use numerous languages like English, Spanish, German etc.Finally, these printers are available at competitive prices to our beloved customers. World's Lightest Industrial Handheld Non-Contact Ink Jet Printer Model IJP – M3S, which is a 4-in-1 Compact design, Zero Maintenance, 300 dpi high resolution, Mains/ Battery Powered SIX line (character height 1.2 to 12.7 mm) Printer & can be used on Porous / Non-Porous products to print B.No., Exp.Date, Time, Serial No. (AGMARK), Logos, Scannable Bar Codes, etc. on labels, cartons, pouches, drums, containers, etc. It is fully programmable using the 4.3-inch full color Touch Screen LCD or with input from Pen Drive and is also capable of printing Multi-Segment / Grouped messages. It can also be mounted on stand for On-Line Printing. 4.3” full color Touch Screen LCD with LED backlight. English, Spanish, French, German, Chinese, etc. 800 x 480 Touch Screen LCD, Pen Drive. 1 to 6 lines of 2000 characters from 1.2 to 12.7 mm high. Store upto 999 messages with Message Name. 42 cc disposable pre-mix ink in Cartridge form with head. Appx. 25 Lakh characters of 2 mm per cartridge of ink. 10 ~ +38ºC 10% - 80% RH, non-condensing. 1.2 Kg excluding cartridge & battery. 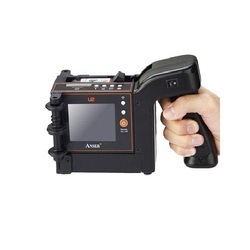 Industrial Handheld Non-Contact Large Character Ink Jet Printer Model IJP – 480P, which is a Compact design, Zero Maintenance, 185 dpi high resolution, Battery Powered EIGHT line (character height 1 to 18 mm) Printer & can be used on Porous / Non-Porous products to print B.No., Exp.Date, Time, Serial No. (AGMARK), Logos, Scannable Variable Bar Codes, etc. on labels, cartons, pouches, drums, containers, etc. 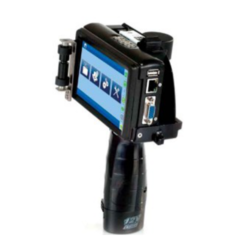 It is fully programmable using the 3.5-inch full color Touch Screen LCD with stand-alone operation (no PC required) where it can print 8 lines Data at a very low price. It is also capable of printing Multi-Segment / Grouped messages. 3.5” full color Touch Screen LCD with LED backlight. 1 to 8 lines of 2000 char. each from 1 to 18 mm high. Store upto 1000+ messages with Message Name. 100 cc disposable pre-mix ink in Cartridge form. Min. 5 to 10 seconds on plastics & laminates. Appx. 45 Lakh char. of 2 mm per cartridge of ink. 5 ~ +40ºC 10% - 90% RH, non-condensing. 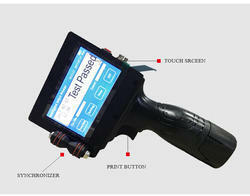 Industrial Handheld Non-Contact Large Character Ink Jet Printer Model IJP – 480H, which is a Compact design, Zero Maintenance, 185 dpi high resolution, Battery Powered TWENTY line (character height 1 to 53 mm) Printer & can be used on Porous / Non-Porous products to print B.No., Exp.Date, Time, Serial No. (AGMARK), Logos, Scannable Variable Bar Codes, etc. on labels, cartons, pouches, drums, containers, etc. 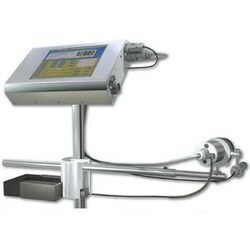 It is fully programmable using the 3.5-inch full color Touch Screen LCD with stand-alone operation (no PC required) where it can print 20 lines Data at a very low price. It is also capable of printing Multi-Segment / Grouped messages. 1 to 20 lines of 2000 char. each from 1 to 53 mm high. 1.8 Kg excluding cartridge & battery. World's Lightest Industrial Handheld Non-Contact Ink Jet Printer Model IJP – M7, which is a 4-in-1 Compact design, Zero Maintenance, 300 dpi high resolution, Battery Powered SIX line (character height 1 to 12.7 mm) Printer & can be used on Porous / Non-Porous products to print B.No., Exp.Date, Time, Serial No. (AGMARK), Logos, Scannable Variable Bar Codes, etc. on labels, cartons, pouches, drums, containers, etc. It is fully programmable using the 5-inch full color Touch Screen LCD with stand-alone operation (no PC required) where it can print 8 lines Data at a very low price. It is also capable of printing Multi-Segment / Grouped messages. It can also be mounted on stand for On-Line Printing. 5” full color Touch Screen LCD with LED backlight. 1 to 8 lines of 2000 char. each from 1.2 to 12.7 mm high. Appx. 25 Lakh char. of 2 mm per cartridge of ink. 1.18 Kg excluding cartridge & battery. This printer is fully Electronic without CORE system & does not have any air pump, viscosity control unit, filters, etc. & so there is no maintenance required (No AMC). It does not require separate make up or wash solution as everything is included in the disposable ink cartridges making it very user friendly for the Operator. 5" 800x480 colour LCD touch screen / 90 degree flip screen design & Computer Software. 1 to 6 lines of 120 char. each from 1 to 12.7 mm high. Appx. 4 million char. of 2 mm per cartridge of ink. 0.49 Kgs for machine excluding cartridge. a. 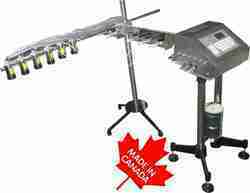 Complete spring loaded Printer stand with bracket for Conveyor mounting. c. 1 No. disposable Pre-mix ink cartridge, Cartridge cleaning Wipe. Our company is very well known in the manufacturing, supplying and exporting of Large Character Ink Jet Printer which have precise functionality and deliver top notch performance. Developed and designed by the leading industry experts, these have enchanting designs and glossy polishing. Utilizing ink to offer excellent prints, these printers are extensively used for the purpose of printing logos, graphics etc. 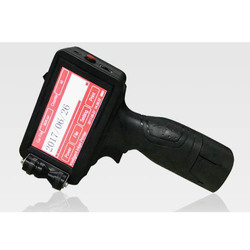 Industrial Handheld Non-Contact Large Character Ink Jet Printer Model IJP – GT250, which is a Zero Maintenance, Battery Powered TWO line (character height 20 to 50 mm) Printer & can be used on Porous / Non-Porous products to print B.No., Exp.Date, Time, Serial No. (AGMARK), Logos, etc. on labels, cartons, pouches, drums, containers, etc. It is an ultra-compact portable and light inkjet printer equipped with a print-head with electromagnetic valves. It is battery operated and Bluetooth controlled & is fully programmable through PC with user-friendly software where it can print 2 lines Data & all Computer Fonts (local languages) at a very low price. It is also capable of printing Multi-Segment messages. Display 2 digit LED display for Message No. Input Device Bluetooth Communication with Computer Software. Printing Area 1 to 2 lines of 120 char. each from 20 to 50 mm high. 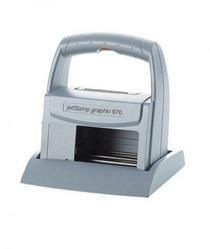 Weight 1.5 Kg ± 10 g including full ink cartridge & battery. Industrial Multi Head On Line Printer for On-Line High Speed Coding on egg trays moving on conveyor (or on multi-track blister packing / Multiple Pouch Sealing machines). It has a capacity of printing apprx. 27,000 eggs / hour. The 1 to 8 line message to be printed is easily composed on its Coloured Touch Screen Graphic display with a combination of small, medium or large characters along with LOGOs, Objects & Scannable Bar Codes. Our company is among the most trusted companies which deal in the manufacturing, supplying and exporting of Thermal Transfer On Line Printer which has best quality and elegant design. These give excellent prints and could be used for the purpose of printing alphanumeric logos, bar codes, etc.Engineered with perfection; these have print density of 300 dpi and weight of 7.8 kg. 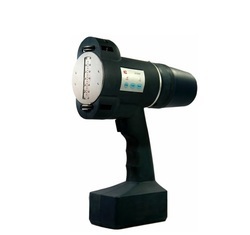 Making optimum use of the latest technology, these provide excellent performance and have reasonable price. , wine, food and beverage, daily chemical industry, electronics, system card, logistics management and other industries. We are providing our clients Color Touch Screen Ink Jet Printer which is ideal for On-Line High Speed Coding on packaging machines or bottles moving on conveyor or Winder / Rewinder systems. The 1 to 8 line message to be printed is easily composed on its Colored Touch Screen Graphic display with a combination of small, medium or large characters along with LOGOs, Objects & Scannable Bar Codes. The Inking system consists of disposable pre-mix ink cartridge using fast drying & indelible solvent-based inks (for porous and non-porous surfaces) which are push fitted into its slot to immediately start printing. 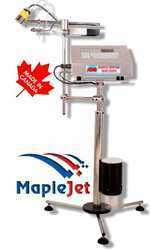 Looking for Ink Jet Printers ?